What if you could read people’s minds? Would you want to? What if someone could read your mind… or plant thoughts into it? What would it mean for privacy NS free will? Would you trust people more or less? David and Ryan are graduate students working on a thought-to-text program. You attach a device to your skull and think clear, simple words and a software program matches the readings from your brain with a dictionary of recognized patterns. They are getting fairly promising results, but are broke, relying on stolen equipment and dealing with a lot of personal problems: Ryan’s dying grandmother, David’s limping marriage. Enter Jordan, a beautiful blonde with a neurochemistry degree, who turns the heads of both men in more ways than one and gives them the breakthrough they need. Realizing that no computer is powerful enough to process all the data going through a brain in realtime, they switch to the only thing that can: another brain. They will send thoughts, one-way only, from one mind to another. Technologically-assisted telepathy. But knowing each other’s thoughts has dangers of its own, and plenty of powerful forces are interested in their work for their own ends. In the days of Twilight Zone and Astounding magazine, sci-fi was all about good ideas. Thought experiments. Explorations into the unknown. Many of the best works took up an intriguing thread and kept us rapt while the author followed it through to its logical conclusions. Writers and readers alike didn’t worry much about style or character development. Listening kind of reminds me of that. Not that the writing, characters or filmcraft are bad, but an appreciation for low-budget constraints and a healthy suspension of disbelief will definitely help you enjoy the movie. 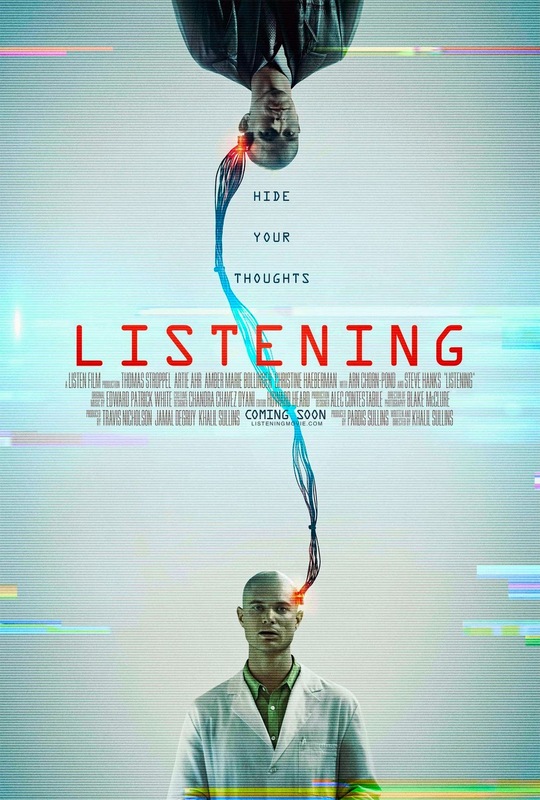 First time director Khalil Sullins follows in the footsteps of Aronofsky’s Pi and Carruth’s Primer in terms of showing indie inventions going wrong, and he seems to have an ear for the language and eye for the laboratory life of scientists and engineers. The acting is rough around the edges, the villain pointlessly cliché and the thriller elements don’t do the sci-fi bits justice, but my biggest complaint is also a kind of compliment: the premise is so good I wish it’d been explored in even greater depth, especially the interpersonal friction of a tightknit group uncomfortably aware of each other’s resentments, fantasies, fears and desires.